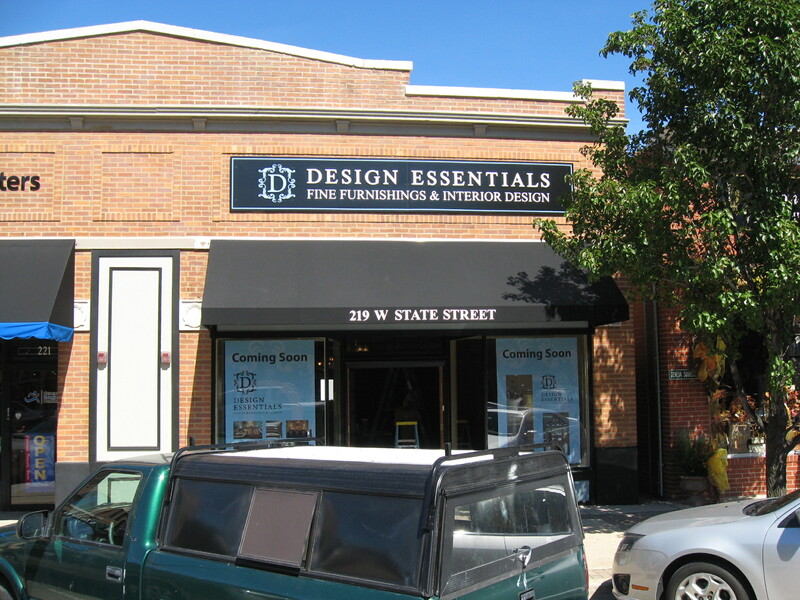 Design Firm Adds Exterior Building Sign & Awning Graphics! Wayfinding. Help shoppers to find you in a strip mall or mixed zone setting with ease. Branding. Give your customers an inkling of the atmosphere that awaits them inside your venue. Marketing. Get your name out, and remember that your logo is an important part of your corporate persona. Case in point is Design Essentials. Located at 219 West State Street, this boutique interior design studio brings beauty and comfort to the home without the sometimes clinical methods employed by remote professionals. Created to help customers find decorative objects and apply creative design techniques that are in step with their personalities, the owners delight in the close working relationships they forge with their clientele. When it came time to add the right type of signage to bespeak this way of doing business, they contacted Mark Your Space. We understood right away that this is a specialty store that needs to not only cater to its niche but also draw in business from consumers who may not have thought of talking to an interior designer. The exterior marker features the company’s name, logo and niche explanation. We then paired this setup with some of our exterior awning graphics. For Geneva, IL, marketing purposes, this is a powerful one-two advertising punch. Can we make an exterior building sign and awning graphics work for your business, too? You bet! Awnings remind of small-town America. 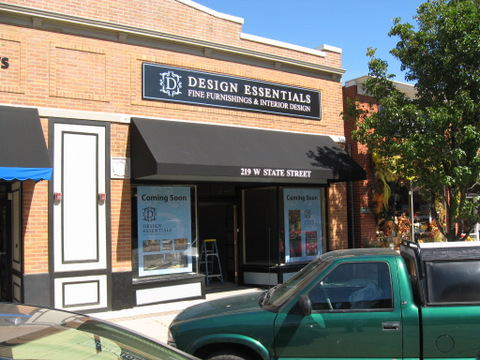 When you look at Design Essentials’ location, you notice that it is situated in a brick building that features a large shade tree nearby. The awning is the perfect supplement to the sign that features a sophisticated logo. This type of combination is extremely visual and powerful in the right location. Outdoor signs bring in the customers. How do customers know where you are? Even if they are using their smartphone locating apps, it does not help if you do not have a very clear and easy-to-read branded marker above your door. Never neglect the immediate installation of proper signage! The sooner folks know that you are moving in – or have set up shop – at a certain location, the sooner you can start a buzz. Combine different marketing techniques. 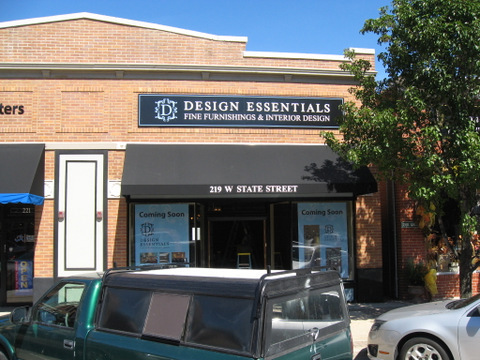 Awnings and exterior signs are just two examples of complementary marketing materials. There are many other combinations that are also quite effective. For example, consider pairing your marker with window decals, graphics, lettering or even a perf! Continue the pairing inside the store as well. Floor graphics and interior banners, posters and point-of-sale signs as well as brochure holders and branded table throws are all means of marketing, branding and generating a heightened sense of name awareness. When you are ready to get this kind of effective marketing setup at your location, talk to our experienced sign design specialists. We gladly come out to your location to get a better understanding of your business locality as well as the products or services that you offer. This helps us to work with you when sketching out dual marketing material campaigns. Ready to start branding with an exterior building sign and awning graphics?